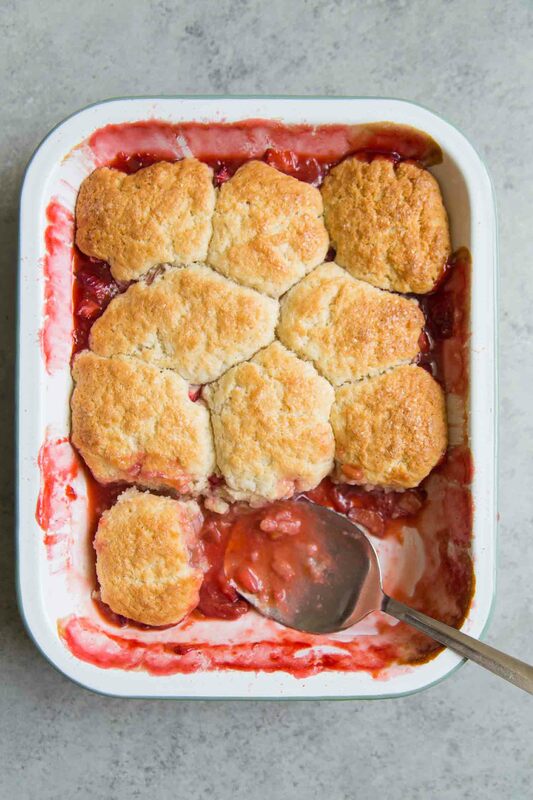 This strawberry rhubarb cobbler recipe was first posted on Recipe Girl. My favorite thing about warm weather? All the fruits and vegetables that make their grand appearance: cherries, tomatoes, zucchini, mushrooms, berries, stone fruits, and more. To me, the harbinger of sunny days, bountiful produce, and lazy summer days ahead is rhubarb. While rhubarb stalks look similar to celery, they are in no way related. I would not recommend eating rhubarb stalks raw. It’s rather tart and unpleasant. Rhubarb is best cooked with sugar to make it’s flavors more enjoyable. Rhubarb is commonly made into rhubarb sauce (stewed like applesauce) or cooked in pies and cobblers. It is popularly paired with strawberries. Strawberry and rhubarb make for a great partnership. 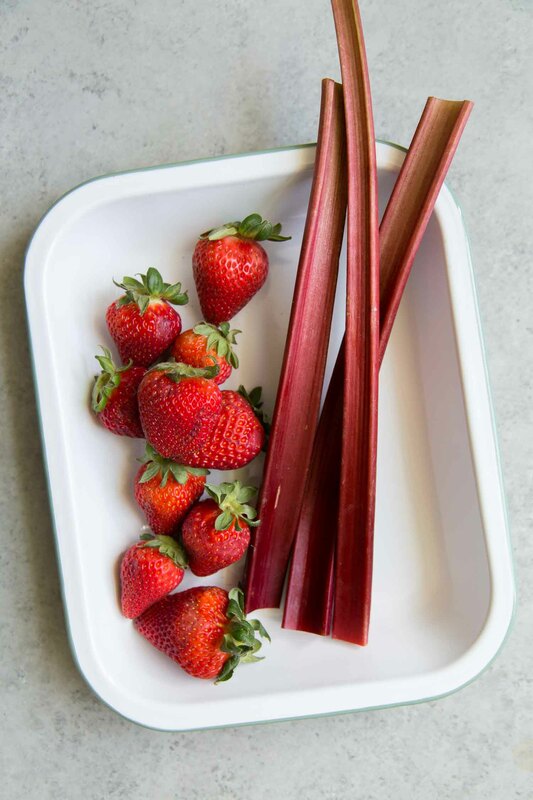 The sweet and fragrant strawberries helps to balance out tart rhubarb. 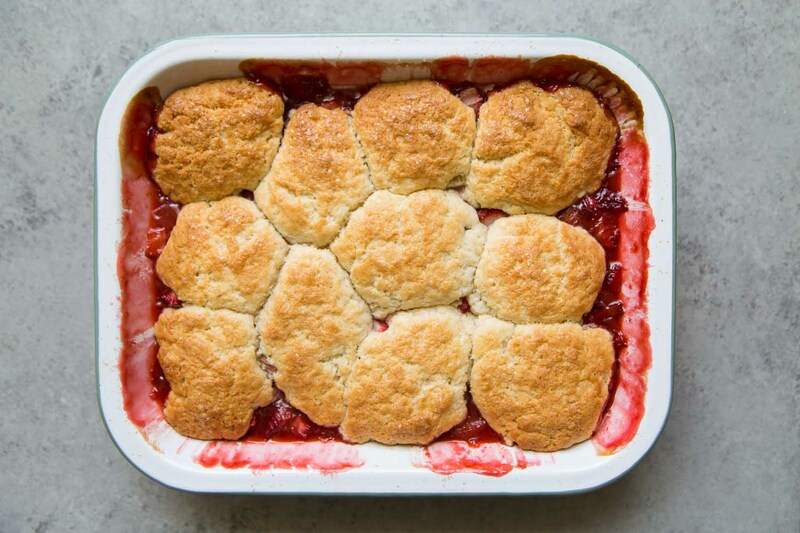 How does this strawberry rhubarb cobbler differ from cobblers? 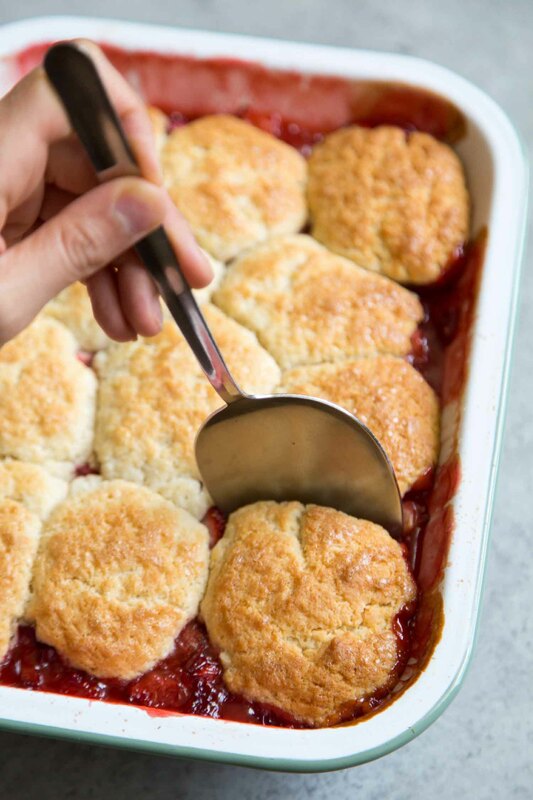 This cobbler is topped with a scoop-able biscuit-like (dumpling) batter. There are various kinds of cobbler recipes. Some have biscuit toppings like this, other have batters like bake up like cake or cornbread. I prefer the biscuit topping because it is easier to portion out into servings. And personally, I enjoy the crisp exterior and buttery, fluffy insides of a biscuit. For extra crunch and sweetness, the biscuits are brushed with a little heavy cream and topped with turbinado sugar before baking. 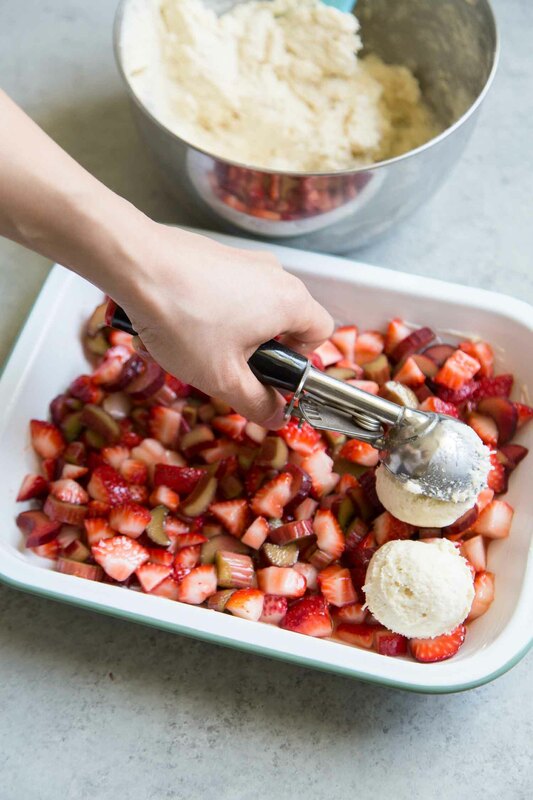 This strawberry rhubarb recipe fills a shallow one quart baking dish. You can also use a 9-inch pie plate or 9-inch square baking pan. The baked cobbler is best served warm fresh from the oven. For extra decadence, serve it with scoop of ice cream or a dollop of whipped cream. Preheat the oven to 375 degrees F. Butter a shallow 1-quart baking dish. Alternatively, use a 9-inch pie plate or 9-inch square baking pan. 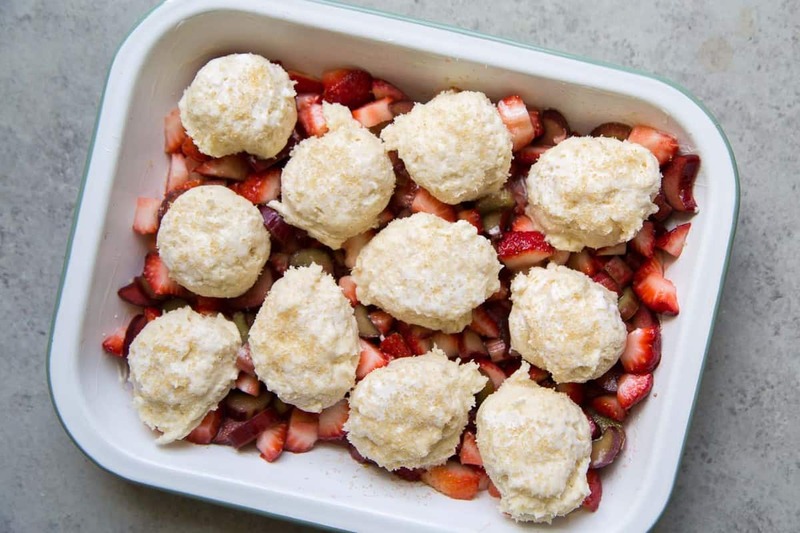 In a large bowl, toss together the strawberries, rhubarb, sugar, salt, lemon zest, lemon juice, and cornstarch. Once well combined, transfer to prepared baking dish. To make the topping, whisk together the flour, sugar, baking powder, and salt. Use a pastry blender or two forks to cut cold butter into dry ingredients until mixture resembles coarse sand. Pour in the heavy cream and fold to combine until thick batter forms. Use an ice cream scoop, cookie scoop, or large spoons to portion out mounds of batter over fruit filling. Lightly brush the batter with heavy cream. Sprinkle turbinado sugar on top. Bake for 40 to 45 minutes until fruit filling mixture is bubbling and biscuits are golden brown. Allow to cool for a few minutes before serving. Serve with ice cream or whipped cream. Fruit filling will bubble and rise during baking. Place a large cookie sheet or baking sheet underneath the cobbler dish to catch any fruit filling that may leak over. If rhubarb is unavailable or out of season, substitute with additional strawberries. Alternatively, substitute other soft fresh fruits such as raspberries, blueberries, or blackberries. What if I can’t find fresh rhubarb? Rhubarb has a short harvest season. Luckily, frozen sliced rhubarb is available year round at most supermarkets.